Developers are circling the city's stock of aging multi-family units and throwing up dense complexes that longtime residents can't afford. 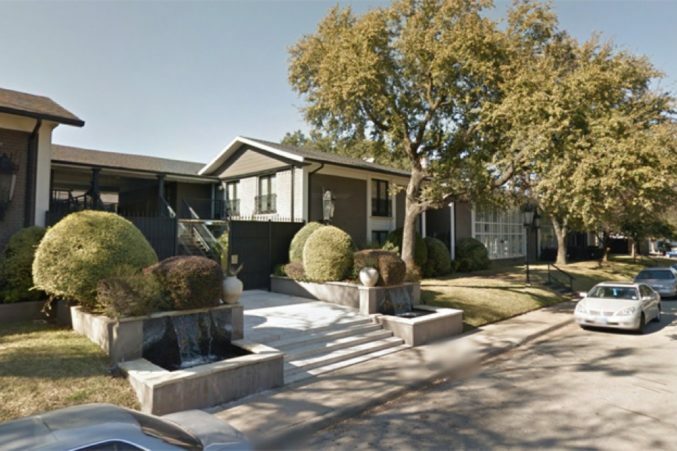 While not as headline-grabbing as reminders of the Confederacy, Dallas’ older apartment stock has been under siege for years and is a more palpable threat to lower-income Dallasites who are increasingly being priced out of their longtime neighborhoods. 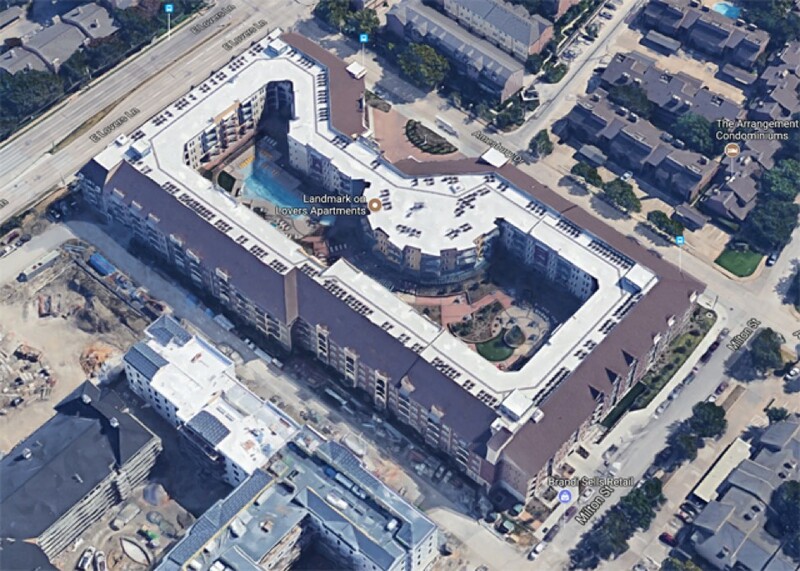 Assuming you‘ve not been under a rock for the past few years, you’ve noticed the staggering amount of apartments being built in Dallas (and, well, nationwide, if we’re being honest). A good number of them are cheaply constructed, short-term buildings meant to squeeze every penny possible in rent before the glue holding the sawdust together gives way. You know what I mean—the stucco necklace of awful buildings ringing the highways is the most obvious place to look. Most of these apartments are thunderously expensive. One building described their kitchens as having state of the art stainless steel appliances. They were Hotpoint. I once quipped that the only place Hotpoint is state of the art is in the Third World. 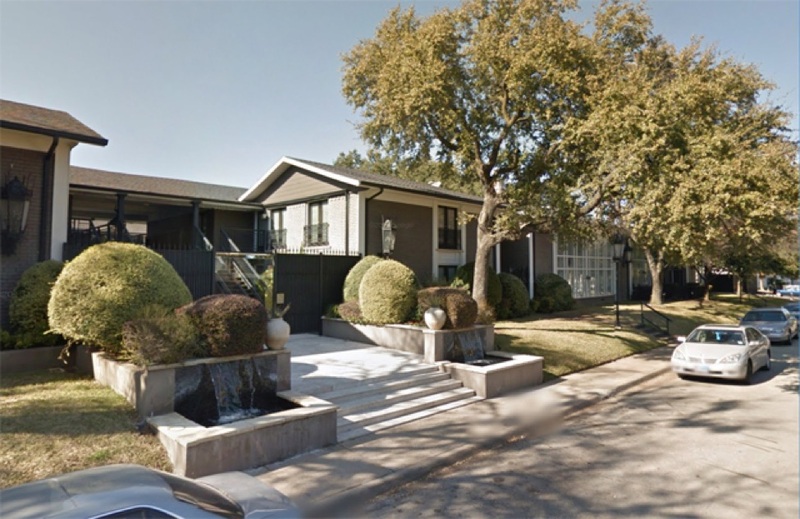 I looked at another building on McKinney Avenue and the cost for a 800-ish square foot apartment was about what I paid in mortgage, taxes, utilities, cable TV, internet and HOA dues on a 1,900 square foot high-rise condo. True stories. But as much ink and zings have been spilled about these Millennial pickpocket apartments, the city has remained largely mum about what was there before these new buildings. But if you scratch the surface you’ll see something more troubling than stucco. 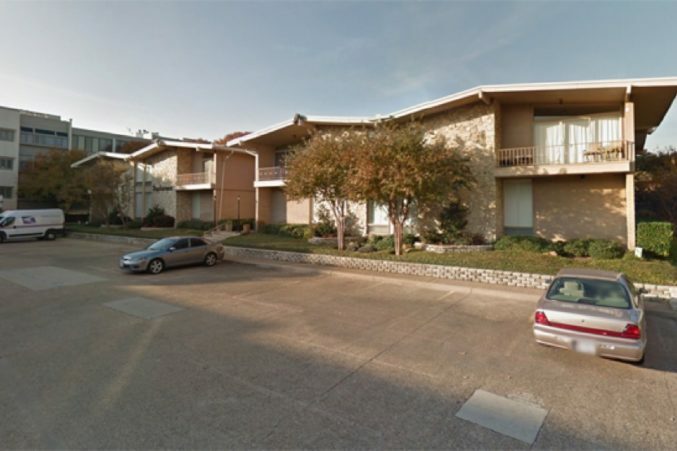 Dallas was chockablock with modestly sized apartment complexes scattered on generous lots. Many were built in the 1950s and 1960s. For those who didn’t arrive in Dallas on the last boat, these were the little complexes that trumpeted “all utilities paid” on their signage in the way hotels of the same era hawked free HBO and vibrating beds. It’s these older apartment buildings, often constructed with better materials than today’s quick-builds, that tell a story of neighborhood displacement. Let’s talk about three areas that tell a story. Original buildings on University and Amesbury with lower density surrounded in setbacks, greenspace and mature trees. In the middle of the last century, this area began life as a vibrant apartment community just south of the more formalized Village development. 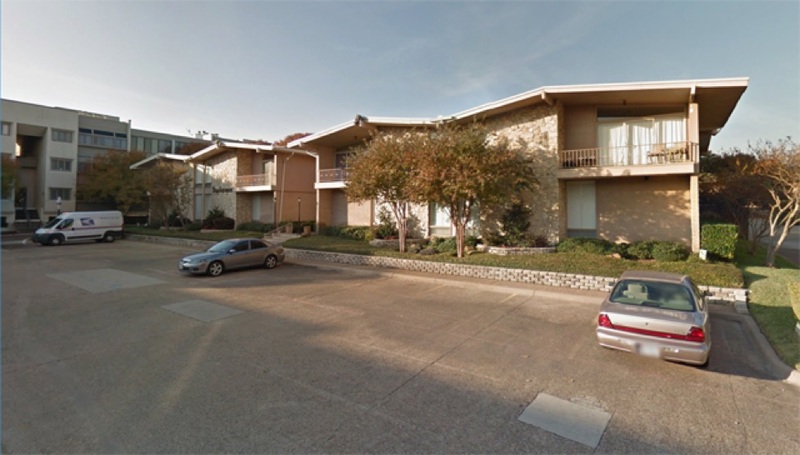 These were small, two-story complexes ranging from a few handfuls of units to 100, give-or-take. One imagines the smaller investor/developers who snapped up these parcels to build worker’s apartments for nearby SMU, the light industrial jobs that originally existed along Central Expressway and Dallas in general. The term “condominium” originated in Babylon in the first century AD, but the first legal condominium in the United States (buying air) was in 1958 in the territory of Puerto Rico. As the concept of condominiums took off and developers wanted to cash out, many complexes around the nation converted to condo beginning in the 1970s. Flash forward to the current hyper-apartment building cycle we remain in. Developers have approached a number of these older complexes because of their low density, which result in larger, buildable lots. Taking down 30 condos on an acre or two makes economic sense when you replace it with 200 apartments. Current owners take the windfall of likely double the condos’ market value and run. Sometimes selling is the right answer. Often, it’s not. As any homeowner will tell you in the frantic market of the past few years, the question isn’t selling, it’s where do you go next? Selling a $150,000 condo for $300,000 still doesn’t net you a lot of options. Certainly not nearby single-family or even townhome options. For all a seller’s newfound wealth, they’re probably don’t have the income to rent in the building that replaces their home. But if you remain, what’s left of your neighborhood? Older two-story buildings are demolished and replaced with extremely dense, three- and four-story buildings. Gone are the old-growth trees that lined the streets. Gone are the generous setbacks and well-spaced buildings. The Landmark on Lovers apartments seen above is a 21st century fortification. A two-unit wide moat surrounding a sacrosanct inner courtyard divorces residents from the neighborhood. Underground parking is great, but not when it’s only used to hog up more of the lot. The sense of space that made the area tranquil has been shattered. But it’s still a great location, so were I living in one of the remaining older buildings, I’d renovate the heck out of it and stay—and make sure my neighbors felt the same way lest it be sold out from under me. This is another enclave of tons of older apartments that remain apartments. What’s interesting here is you have large management companies like Bellmar snapping up older buildings and renovating them for new tenants. This means new kitchens, new bathrooms, and new amenities. What was a little tumbledown not-so-many years ago are now quite comfortable homes. Again, being part of a bygone era before the too-much-crap generation heralded the self-storage market, units are potentially smaller than your dreams; they lack get-lost-in closets and gourmet kitchens. But there is granite, subway tile and a fitness center with enough gear to help work off your last Hagen Dazs fix. Partly because the unit sizes themselves limit what can be done with the buildings, rents are fairly livable. They’re certainly less than in their tumbledown days, which means there was likely a good amount of tenant displacement as the renovations rolled on. But I suspect it’s a whole lot less than in many former low-cost apartments that have been tarted up beyond most folk’s ability to pay. For example, I’m looking at a pair of 800 square foot renovated two-bedroom units for $1,285 per month or $1.60 per square foot. In Uptown the same sized unit would push $2.90 per square foot totaling $2,320 per month. In another complex there is a similarly sized two-bedroom for $1,255 per month. And, unlike some new builds, all of the bedrooms in these complexes have windows and walls that reach the ceiling! 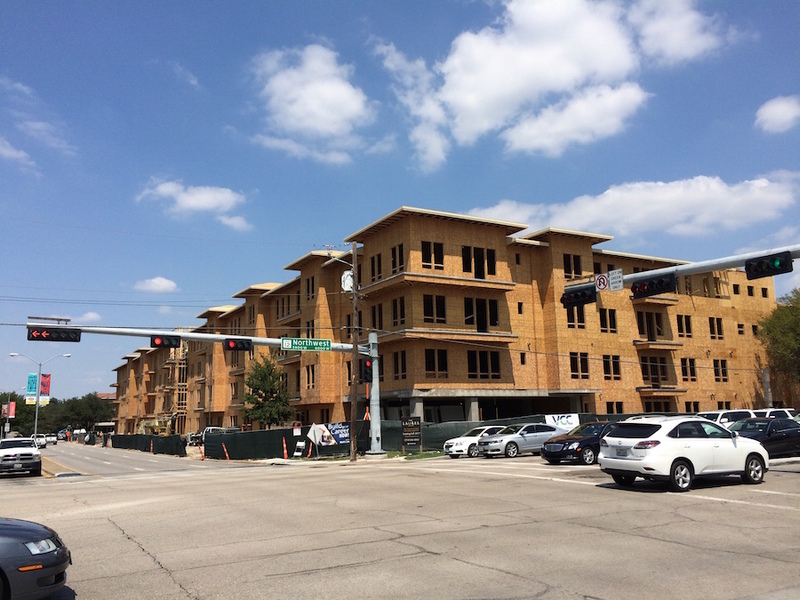 While you’re not in Uptown, you’re strolling distance from the nouveau-tony Preston Hollow Village that promises to add plenty of restaurants, bars, and grocery options (Trader Joe’s is already there). If you’re over 50 or deft with Google, the area is colloquially known as either Behind the Pink Wall or “where grandma lived.” The wall is now beige and between the blue hair and the blue water in the toilets, pink isn’t the first color that comes to mind. You may recall several years ago there was a battle to develop the northeast corner of Preston Road and Northwest Highway into apartments, replacing a group of frowzy apartments and townhouses with a three story apartment building. That building, The Laurel, is under construction and is the first construction in the area since the 1970s. 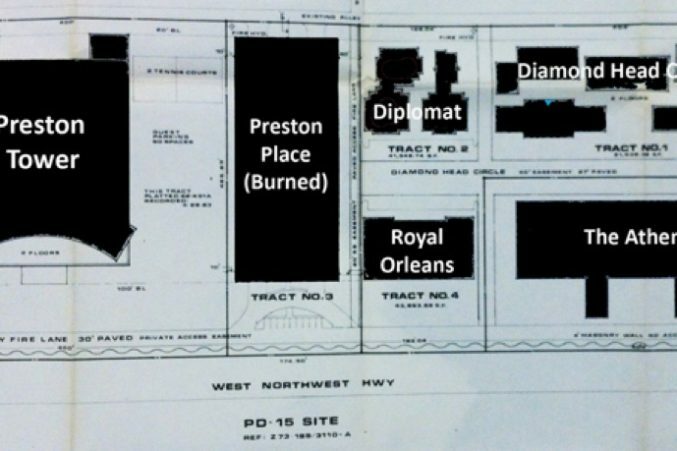 Most recently, back in March there was a seven-alarm fire that destroyed the 1970s Preston Place condo building. That and other events have spurred developers to circle the area like vultures. 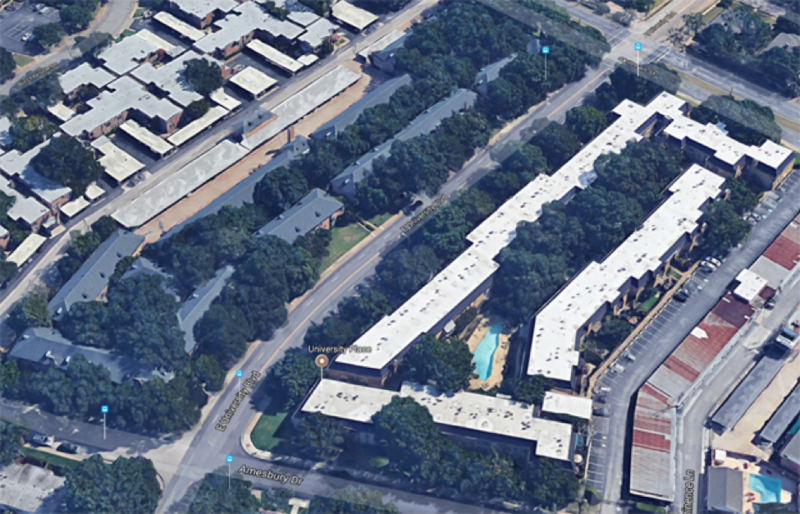 There are currently four neighboring buildings being courted that currently hold 135 units (including Preston Place’s 60). One building already has a contingent contract with a developer hoping to cram 120-ish apartments on one-acre that currently holds 15 units. Like the redevelopment going on in the first example, density and neighborhood aesthetics are critical to avoid that area’s increasingly fortress feel. But what this area of the Pink Wall has that other areas don’t is a designation as a Planned Development District (PD-15 dating back to 1947) with its own set of development rules. Because of this, Councilwoman Jennifer Staubach Gates this month formed a task force to explore the options for development in the area. In other words, neighbors have more leverage because of the PD. However, regardless of the leverage, land costs will, in part, push up the rents in any future development well beyond the means for most of the existing residents to afford. You see, the once-chichi Pink Wall had fallen on hard times as some buildings fell behind in maintenance and residents aged without renovating units. In any other city, the gay community would have latched onto this inexpensive enclave and spiffed things right up. What the future holds for this area is anyone’s guess. As a PD-15 resident and member of Gates’ task force, I’m definitely on the front lines. As you look over these three examples, you see differing ways that older, more graciously proportioned multi-family dwellings are being renovated or replaced. In each example, existing residents are unlikely to be able to afford to live in the homes that have either been renovated or rebuilt beyond their means. In two of the examples, affordable condominium buildings are being torn down and replaced with largely unaffordable apartments. Dallas loses housing stock for buyers who don’t want or can’t afford a single family home anywhere remotely near their original condo. And while the Great Recession caused a spike in rental households, the market for housing affordable to buyers remains strong as inventory evaporates. In the case of apartments being renovated, new rents likely rise in excess of many tenants’ ability to pay. However, while they cost more, increases are nowhere near the magnitude of new-build complexes. 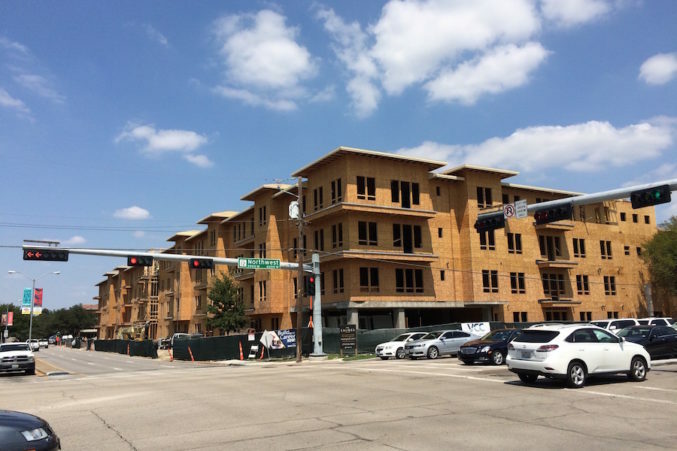 Specific to the Preston Hollow Village adjacent apartments, the draw of that development will also assuredly increase their rents further as it becomes more desirous. This wholesale affordability issue is problematic at most income levels, but nowhere more acute than in the lower-income brackets disproportionally comprised of minorities. While we can debate the merits of Confederate symbols in public spaces, Dallas needs to get off its high-horse in housing all its citizens.